Stories of writer Peter Bowles and the decadence of Tangier, of Sam playing it (though not 'again' despite popular misquotes) in Casablanca and of the hippy-trippy '60s trail to Marrakech all give Morocco an exotic air. The other big draw these days are the Moroccan riads . The explosion of these designer delights in the narrow back streets of Marrakech and Fes is an added reason for those who love all things luxie to take the Marrakech Express . Sorry, I can't help but mention that song. It plays as an internal sound track throughout our trip despite our best attempts to replace it with something more 21st century. We hire a private driver and car for our tour of Morocco and in the air-conditioned back seat we sing it loudly and often and, sad to tell, find we know most of the words. Our driver covers his ears, chaabi is more his style. The fabled city squats on a flat plain in the foothills of the snow-topped High Atlas Mountains. Its walls are prawn-pink, its tiles come in shades of mint green, cinnamon brown and saffron yellow and its women make up for the fact that they are covered from head to foot by swathing themselves in jewel-bright colours. "Marrakech is the Chicago of Morocco, madam," an almond-eyed boy in the Marrakech-wannabe town of Touradant once told me, his skinny legs protruding from baggy Bermuda shorts, his skater cap on sideways. Of course, he was right. You have to have your wits about you; how the herb-addled hippies survived I'll never know. The cities central square, Djemaa el Fna, boasts jugglers, snake charmers, acrobats, storytellers and pick-pockets. Once upon a time the square attracted the citizens of the city like a magnet. Now most of the performers seem to be there for the tourists. Glance at a performer for more than a millisecond and they'll demand payment. Only the storytellers, their tales winding on into dusk, seem to attract a genuine audience of locals. The best place to survey the scene is from one of the rooftop cafes that surround the square. Head to Les Terrasses de l'Alhambra for a great view and decent coffee (the place is French run). There is plenty of sightseeing to be done in Marrakech. You can visit the Palais el Bahia, once the palace of the grand vizier, with its cloistered harem or the marbled Saadian tomb or stare at the minarets of numerous mosques. However, it is the dust-speckled back streets of Marrakech and the secret souks which attract. The markets sell everything from beaded waistcoats reminiscent of the city's hippy heyday to curling embroidered slippers and Aladdin lamps. Carpet shops also abound, although the only thing which is magic is the speed at which ingratiating attention can turn sour when you decide not to buy. These days you'll find a burgeoning number of bijoux designer boutiques too. If money is no object and you like your accommodation grand, the place to stay in Marrakech is the elegant and newly refurbished La Mamounia hotel with a sweeping limo-wide drive and gracious gardens. Closed for three years for an impressive make-over, it opened its door again in late 2009. Out went all the Art Deco (auctioned off in a grand sale to collectors), in came Moroccan/Andalucian style, a return to its Arabian roots under the direction of French designer extraordinaire Jacques Garcia . There are fountained courtyards, hand-crafted doors and furniture and almost 90,000 square feet (27,000 square metres) of zelij (traditional tile work) gracing the walls of the building. Only the stunning gardens - a famous refuge from the heat and the dust - are recognisable to former visitors. The new General Manager Picquot Didier, formerly of the Ritz in Paris and the Pierre in New York, ensures the service is as impeccable as the re-design. If you really want to arrive in style, book an airport pick-up in the hotel Jag. As you step into the lobby inhale deeply; that cedar wood scent you smell has been specially created for La Mamounia by French celebrity-perfumer Olivia Giacobetti (see below) to sooth your senses. The kind of people who choose to stay at La Mamounia also party at Le Comptoir with its crimson tadelakt walls; the Euro-elite, moneyed-Moroccans, the Hollywood A-list all gather here. Those who prefer a more alternative vibe take a taxi out of town to Pacha Marrakech, sister to the funky Ibiza club; a place with enough pulling power to feature hot DJs from Ibiza and New York. I still prefer the cobbled backstreets so we head to Cafe Arabe, which was the first decent cafe in this spider web of old alleyways and still one of the best. From its rooftop terrace we can hear the call to prayer from the nearby mosque as we sit and ponder our next move. Where to stay once you've left the court-yarded seclusion of riad-land? - That is the question. A little way from the centre Jnane Tamsna, set in eight lush acres (3.2 hectares) in the Palmeraie (palm groves outside of central Marrakech) is another obvious oasis. It is the creation of designer and hotelier Maryanne Loum-Martin and husband Gary Martin who also created Nicole Kidman's favourite Dar Tamsna villa in the '90s. Beyond the Palmeraie things used to be arid in more ways than one. Richard Branson's opulent Kasbah Tamadot, an hour from Marrakech was about as far as many luxury lovers cared to travel. Then came the divine Dar Ahlam with only nine suites & three villas just outside Ouarzazate and next in 2009, the 15-room Kasbah Bab Ourika , which opened on the edge of the Ourika valley in the foothills of the Atlas Mountains also near Ouarzazate. Perched on a hill overlooking the river the Kasbah Bab Ourika is a retreat from the claustrophobic chaos of the walled cities. Forget hawkers, the only things you'll be surrounded by here are rolling hills. The views from its terraces are stunning and the hotel itself has tasteful antiques, cool secluded courtyards and burnt pink walls. But we must move on, we are bound for Erfoud and the mysterious desert. Our car crawls its way up over the Tizi 'n Tichka pass across the High Atlas while we argue about whose souvenirs are weighing us down most. At the top it seems to heave a sigh of relief - so much for its description as a 'luxury limousine'. It obviously needs a rest so we seek the haven of a café. We avoid the coffee - which tastes as if it is made from old socks - and opt for mint tea. Tea drinking is an essential part of Moroccan life. It is used to welcome strangers, cement friendships and seal carpet deals. Poured with a flourish from a great height it splashes into your glass like a green waterfall. The best tea is made from sprigs of fresh mint and accompanied by trays of almonds, figs and sultanas. We negotiate our way back to the car through village children yelling "Stylo!" and "Argent!" with hands like little claws that grab at us as we past and we head on towards the desert town of Erfoud, with its biblical buildings and old men with long dusty beards. Our gentle guide Mohamed presents us with a business card which promises that 'the wonders of the desert defy your dreams and imagination'. We are enchanted. The next morning finds us up before sunrise (a rare thing) on a 4WD tour to Merzouga and the shifting sands. We stand on Lawrence of Arabia dunes at the edge of the Sahara, our scarves billowing like sails in a sea of sand. The pre-dawn desert is cold between our sandalled toes. As we watch silver sun appears and the desert begins to glow. The wind is getting stronger, whipping up the sand into our eyes and mouths. We take refuge in a low-slung Berber tent fit for a sheik and drink more mint tea. From the desert, the road snakes back into the mountains and northwards towards Fes. 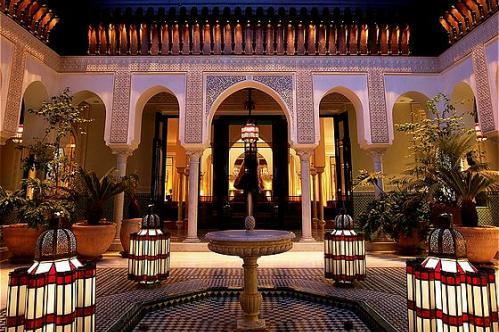 And so we arrive at the Sofitel Fes Palais Jamai, one of Morocco's most luxurious and beauty hotels. The hotel is an oasis of calm with big bath tubs to wash away the desert dust. Bougainvillea spills from their shady balconies. I wander through its walled gardens and courtyards and feel like the daughter of a sultan. Turquoise tiles sparkle around the pool. If Marrakech is henna-coloured then Fez is cool blue and white. The high-walled, narrow streets of the old city are like a labyrinth. With every turn of a corner you are sucked deeper into the maze of the medina. The further in you go, the further the 20th century recedes. On the outskirts are stalls selling fake Gucci bags. Further in are coppersmiths beating a rhythm on burnished pots, cobblers, furniture makers and weavers. We wander past dark doorways where families live in tiny airless rooms, and past mosaic courtyards with orange trees hidden behind high walls. Donkeys are still a traffic hazard. "Balak, balak" is the warning cry as the overladen beasts bounce off walls and hapless tourists. To avoid a collision I leap out of the way in the nick of time and straight into the courtyard of a mosque. That a Christian, and worse still a woman, should set foot on sacred ground is too much for the gate-keeper. I am unceremoniously ejected back out into the path of the next donkey, narrowly missing death by carpet crushing (the load it happens to be carrying). It is clearly an omen - time to book a flight home. Photos: Courtesy of La Mamounia.